As a member of the Master Builders in Australia, StoneSet works closely with community architects and landscapers to provide applications that continuously meet their strict requirements. Our products protect waterways by reducing pollutants caused by puddling and runoffs. Our high-grade binders allow water to seep into the ground quickly while holding fast to the paving materials for a hard packed, reliable surface. Each design is unique and requires specific conditions be met for a high standard of public safety. Whether it's a path in the park or a walkway at the community hospital, our permeable materials prevent water damages that crumble surfaces and work to protect the local water table. The strong bonding materials provide a hard, reliable surface that makes maintenance easy and increases usability. As the needs of communities continue to grow, it becomes more important to protect natural resources. Our porous, permeable materials help meet those requirements. Trees, shrubs, and local foliage benefit from the use of these materials because there is easier access to the water and nourishment necessary for them to remain strong and healthy. This provides your community with a healthier environment making it more inviting to businesses and residents. As community members work hard to keep budgets under control and meet environmental standards, they turn to our products for cost-effective solutions. We work closely with our communities to offer porous, permeable products that reduce pollutants while making your schools, parks, and hospitals affordable, safer, and healthier. 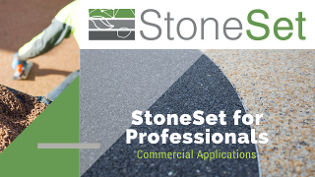 Contact us here at StoneSet to learn more about the various ways we can help create an environmentally friendly solution to your paving needs.